chooses a ‘compromise’ ending between the two that Dickens originally wrote. So who are the 'critics' who are in 'uproar' about this 'changed' ending? Robert Douglas-Fairhurst, an Oxford don and author of the book Becoming Dickens, said it was impossible to run out of ways to interpret the writer. He said Miss Havisham as a "cougar rather than a crone" is "absolutely right" and added that Dickens always wrote his endings so they could be interpreted in different ways. "I think Dickens is strong enough to withstand anything we do to him," said Dr Douglas-Fairhurst. "He has a chameleon-like ability to adapt to changing circumstances." 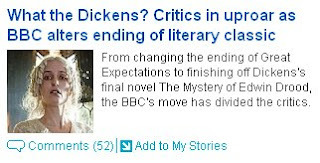 He added that it was fine to mess with both the time structure and the endings of Dickens' novels. "Dickens is inexhaustible," he said. Not really an 'uproar' is it? Fascinating how they say "the BBC’s move has divided the critics." 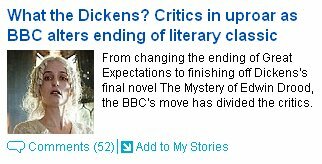 and then "Literary purists claim the BBC is meddling while commentators fear Dickens overkill for the season of shows." So, they're divided between disliking it and ... disliking it. Thanks for the balance, Daily Mail! You'd think the Daily Mail would be familiar with the concept of "Adaptions," given how they adapt the truth so frequently.